A field designed to determine which genes (or blocks of genes) are expressed under certain conditions. For example, transcription is induced (or repressed) in which genes during heat shock? What genes are turned "on" in breast cancer cells? Is my favorite gene involved in a particular environmental response? Previously, analysis carried out on individual genes via RNA (northern) blots. Now we can generate more data in one experiment than could be performed in years of experimentation using northerns. Downside? Over-interpretation of the data. Expressed Sequence Tags -- why bother with the whole genome when you are only interested in the coding regions? How do we make ESTs?-- Make cDNAs from an organism's mRNA. (figure) Sequence about 150 bases of the 5' and/or 3' end of each cDNA. This is the EST for that expressed gene in that organism. 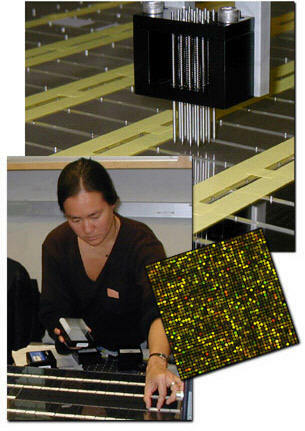 Microarrays -- sometimes called DNA chips, size of microscope slide, can spot thousands of genes or oligos on a single slide using robots and "pins" that spot less than 1.0 nL of DNA sample (such as an EST) to make a spot less than 75um in diameter.